During World War II, the Nazis had an unbreakable code system called Enigma. If the Allies had any hope of winning the war, they had to crack the code. In his latest film, The Imitation Game, Director Morten Tyldum introduces us to the man chiefly responsible for breaking Enigma: Alan Turing. His story is fascinating and quite possibly the best film of the year. Alan Turing (Benedict Cumberbatch) was a brilliant mathematician and codebreaker who, with a team of other scholars, worked with the British military and MI6 to try and solve Enigma. However, Turing had a few secrets of his own that put him in danger from his own government. Also, as depicted in the film, Turing was very socially awkward. He didn’t understand jokes and was very matter-of-fact in all his dealings with others. This made him quite unpopular among his fellow codebreakers, so before he could solve Enigma, he had to win them over first. Turing’s plan was to combat the Nazi’s Enigma machine with another machine that he would create, thus becoming one of the fathers of computers and artificial intelligence. Of course, all his work during the war was kept secret for decades. Simply put, The Imitation Game is a fantastic film. Turing is a compelling character as are his supporting characters including Joan Clarke (Keira Knightley) and Hugh Alexander (Matthew Goode). There are talks of minor historical inaccuracies between the film and what really happened, but that’s why the material is based on a true story. The major beats are the same, though, and the story is no less compelling. Altering minor details for dramatic effect doesn’t change the importance of Turing’s life and work. The film also has a lot of humor, which juxtaposes nicely with the horrors of war and the personal horrors Turing endured. 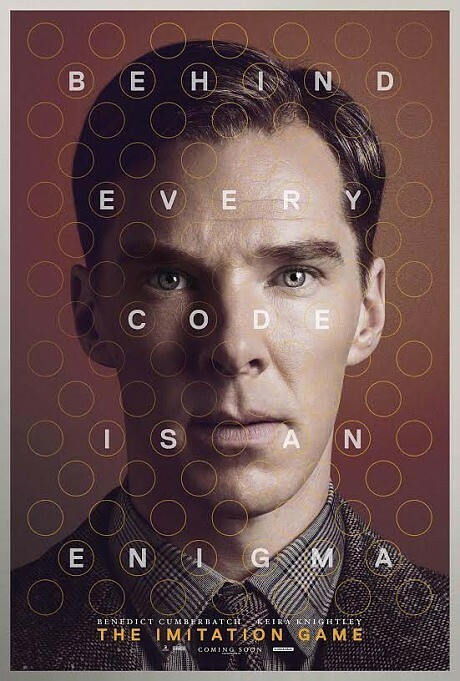 Benedict Cumberbatch is mesmerizing as Turing, perfectly capturing his idiosyncrasies as well as his genius. His performance is at turns powerful, hilarious, and heartbreaking. Knightley is also great as Turing’s closest friend, Clarke. Charles Dance is his usual sardonic self as Commander Denniston, while Mark Strong puts in a great turn as Stewart Menzies, an MI6 agent. Special mention also needs to be made for Alex Lawther, who plays the young Alan Turing. His performance mimics Cumberbatch’s well, making it believable that they are playing the same character. Just solid performances all the way through. As of right now, for me, The Imitation Game is the best film of 2014—I still have a few left to see. It has everything going for it and is just a spectacularly well-made film. Cumberbatch will definitely be involved in the Best Actor discussion and his performance anchors this great, great film. This entry was posted in Movies, Reviews and tagged Alan Turing, Alex Lawther, Benedict Cumberbatch, biopic, Enigma, Film Reviews, Films, Hodgepodge, Keira Knightley, Matthew Goode, Morten Tyldum, Movie Reviews, Movies, Podcast, World War II. Bookmark the permalink. I wouldn’t go as far as “the best movie of 2014” but definitely agree The Imitation Game is a convergence of a great script, actors and director. The film left me immensely impressed with the characters’ accomplishments, but with heartache over the loneliness endured. The three time periods presented in an overlapping fashion was effective since the three stories reinforced each other. My only complaint was the heavy handedness toward the end of the movie, especially with one certain catch phrase. I felt that 2014 was a year of movies that I really liked a lot, but few that I really loved. For me Imitation Game had pretty much everything going for it and it hit me just the right way. That being said, this isn’t like 2013, where I felt that 12 Years a Slave was the far and away best film of the year. It’s a subjective title, but I think this year of all years, there will be a lot of lists from various critics that look completely different.